UH-Manoa students Justine Herrera, left, Joshua Greenspan and Eli Kimmerle hang out in Greenspan's Hale Noelani unit. At right, an electrical outlet hangs exposed by its wires. Student housing quality has led several students to seek housing off campus. Officials at the University of Hawaii at Manoa say they will not raise housing rates this fall, but students will still have to pay about 6.7 percent more to live on campus for the full academic year and should expect larger increases in the following years. The housing office had been looking at raising housing fees in August to pay for higher utility costs, but didn't have enough time to hold public hearings and bring the issue to the Board of Regents for approval. Instead, UH-Manoa is planning to charge dorm and apartment residents for the break between the fall and spring semesters. Currently, students who move out during the 18-day winter break do not pay for housing during that time. The extra money -- about $227 for the most common shared dorm room -- would be pro-rated with current fees and would not need regents' approval because the cost per semester and the cost per day are not changing, said Wayne Iwaoka, UH-Manoa's vice chancellor for students. He emphasized that students will have some benefit from paying for their rooms over the break because they will have the option of using their rooms and will not have to move out and put their goods in storage between semesters. Students can avoid the increase by just paying for the fall semester instead of the full year and re-applying for housing in the spring. But they may not get the same room assignment and are not guaranteed housing, Iwaoka said. "It seems to me we're paying for room security," said Grant Teichman, president of the Associated Students of the University of Hawaii. "It will make things more convenient, but at a higher price." Other students who live in the dorms now had mixed reactions to the increase. "It's just paying for nothing," said Bryan Hayashi, who is from a neighbor island. "I go home between the fall and spring." Megan Centeio had a different opinion. "UH housing right now compared to other schools in the country is very low, so I don't think an extra $227 is going to make a difference," she said. "I think the living conditions are horrible anyway," said Jessica Martinez, who said she's planning to pay more to live off campus next year. "It's worth it to pay a little bit more for better conditions and parking." All of the students interviewed by the Star-Bulletin said the university shouldn't raise rates unless they improve the dilapidated conditions in the dorms and student apartments. Some improvements are planned starting this summer using taxpayer-financed bonds, Iwaoka said. But he said some future dorm improvements might be paid through bonds repaid by housing fees, which would require a rate increase. A student survey conducted as part of the planning for a new privately built dorm on the site of Frear Hall suggested students would be willing to pay between $5,220 for a shared room and $8,130 for a private room per academic year in a renovated or new dorm. The new 814-bed dorm at Frear is expected to be ready for occupancy the fall of 2008. At a regent's meeting last month, officials from American Campus Communities, the company developing the dorms for the university, said they were looking at charging between $4,250 and $6,990 per academic year for beds in the new dorm. Any housing-fee increase would coincide with previously approved tuition hikes that start this fall. Tuition at UH-Manoa is increasing 140 percent over the next six years. Iwaoka acknowledged that the university did not start planning soon enough to come up with a housing fee schedule for the fall. Iwaoka just started in his newly created position in October and the housing office has been in transition for the last three years with three different directors, he said. The current schedule of housing-fee increases ended this spring and the process to come up with introducing a new fee schedule usually starts up to a year and a half ahead of time, housing officials at other UH campuses said. Housing application forms are still not posted on the UH-Manoa Web site even though students are already applying for fall admission and a priority financial aid deadline is approaching on March 1. Jamie Uyehara at the UH-Manoa financial aid office said she needs to know this week what the estimated housing costs are for the fall so that the staff can start processing financial aid applications. 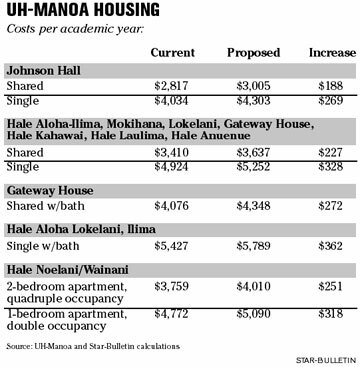 Because there's not enough time for a housing increase this fall, Iwaoka said UH-Manoa will work on coming up with a new fee schedule for fall 2007 and is hoping to hold public hearings on the new fees perhaps late this spring or early in the fall. The housing office will try to cope with increased utility and other costs this year by not filling vacant positions, Iwaoka said. He noted that charging for the winter break will also mean increased costs for the housing office because all of the dorms and apartments will have to be staffed over the holidays, so it's not clear how much additional money will be generated. At UH-Hilo and Maui Community College, which also offer student housing, fees are increasing 15 percent this fall, part of previously approved housing-fee increases through 2008. On-campus housing fees for the 620 beds at UH-Hilo range from $2,524 a person for a shared room per academic year in the Hale Kanilehua and Hale Kauanoe dorms to $4,580 a person for a one-bedroom apartment in the Hale 'Ikena apartments. At Maui Community College, a new private off-campus dorm is scheduled to open in the fall with 400 beds. However, housing rates for the project have not yet been set. MCC also operates 44 beds in an 11-apartment building across from campus. Rates are $3,210 a student per academic year for a shared bedroom. For students on Oahu, moving off-campus probably means paying more money than the student dorms and apartments. The 12-month average price for off-campus housing listed with UH-Manoa's off-campus housing office is about $1,160 a month for a one-bedroom apartment and $1,700 a month for a two-bedroom, not including utilities.